Nature, the outdoors and travel have always been passions of mine. I was born into an adventurous and nomadic family; as a child I was brought up between England and Andorra and schooled in four different languages. After school my travelling continued with 10 back to back winters, in which I competed internationally for Great Britain in alpine skiing, between Europe and New Zealand. In 2011 I moved to South Africa and completed my training to become a safari guide. I worked as a safari guide in the Waterberg for five and half years and it was here that I was introduced to Quark Expeditions. Andrew White, the President of Quark Expeditions, was a guest at the lodge I worked at. I was fascinated by Andrew’s stories of the Polar regions and it was in Africa, of all places, that my Polar bug began. At the end of 2016 I took a year out with a friend to backpack around the world. Our trip was predominantly nature based—travelling from one national park to another. Looking for wild tigers, jaguars and platypuses. Towards the end of the trip I contacted Andrew who put me in touch with Alex McNeil, the Expedition Staff Manager at Quark Expeditions. My first interview was whilst I was in Ecuador. For the second interview I had to pass a test. Thankfully by this time I had made it to the United States where I could buy some reference books. I spent many a night under the stars in Yosemite National Park with my torch and books learning about the circumpolar current, how ice is formed and the difference between the penguin species! At the beginning of November I joined the team in Ushuaia aboard the Ocean Endeavour. I was grateful to be able to be there for the Quark Expeditions Guide conference. Many from the Toronto office made the journey. It was refreshing and exciting to see how passionate everyone was about the company and the launch of Quark Academy, a program that ensures all new hires meet Quark’s guiding and safety standards before going into the field. The following day the Quark Academy trainees met. 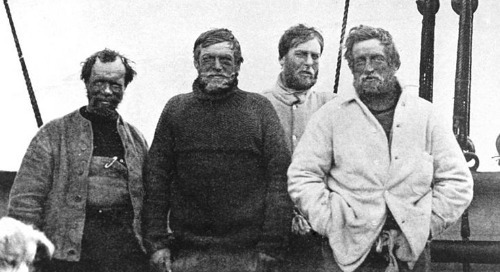 Everyone brought something different to the team; some had guiding experience, others had been captains of ships, some had worked on other ships in Antarctica and some had PHDs in penguins! Despite our different backgrounds we all shared a few things in common; a love for people, the outdoors and lots of enthusiasm. For the next twenty days the Ocean Endeavour was to be my home and classroom. I had never spent so long on board a ship and I have to confess to being worried about the Drake Passage. Thanks to the doctor on board I had some good advice and stocked up on medication which was carefully managed and I didn’t have any problems with sea sickness. Our first day at sea was spent in various classes learning the basic procedures of operations. I spent every break on the stern with my binoculars and spotted, to name a few, black-browed albatrosses, cape petrels and Antarctic petrels. I was up early on the second morning to find sea ice with Antarctic fur seals sitting on it. Later that day I saw my first iceberg! The following day the ocean was full of icebergs! Small ones popped and groaned as the ship grazed them. The Expedition Staff were extremely helpful and supportive and welcomed us as part of the team. During our time in Antarctica, we had the opportunity to sit in on several zodiac cruises that were conducted by the guides. My first zodiac cruise at Danco Island was a sensory overload! There were hundreds of gentoo penguins in the water porpoising all around us! It was incredible to see how agile they were. We later saw a Weddell seal. He lay on the ice ignoring our presence as we sat quietly watching him. Then, seemingly from nowhere, robotic, almost alien noises, filled the silence—at first I wasn’t sure where the noises were coming from! It was the Weddell seal ‘singing’. Under the guidance of experienced and immensely knowledgeable trainers, we learnt the essential skills of a Polar Guide. We had lessons and exams in knot tying, navigating and radio use and procedure. We learnt the importance of GPS use, always carrying spare batteries for everything and respecting the elements in this remote wilderness. Occasionally our classes were interrupted by sightings of orca or humpback whales around the ship. My favourite element of the training was learning how to drive a Zodiac. It was so surreal driving past giant icebergs and seeing penguins porpoising around the boat. Our training was thorough and we learnt the basic mechanics of the zodiac, how to drive through surge pools and ice. We also did a lot of man overboard training. Although the environment was very different from the African bush the basic guiding principles and people skills are the same. Quark Academy trainees participate in a man overboard exercise. Towards the end of our first and second voyage we were tasked with running a snow shoe activity for the passengers on Half Moon Island. This was a great team building exercise and we succeeded in creating a great experience for the passengers as we guided them on a walk. From this we also learnt the operations and importance of time management. After leaving the Ocean Endeavour I joined the team on the Ocean Diamond for a month and a half. The skills acquired during my time in the Quark Academy ensured that upon my arrival I was a valued team member, confident and capable. For me, the highlights of guiding are meeting people from all walks of life and learning about other peoples experiences. In my new role as a polar guide it was a pleasure to get to know some of the Quark passengers and to be a part of their trip to this magical continent. Each voyage I was excited to return to Antarctica. I wanted to be on the look out for whales, see how the penguin chicks were growing and share in the passengers delight when they saw their first iceberg. I am now back guiding in South Africa but the polar bug has been planted and I am already looking forward to the next Antarctic season! Want to learn more about Antarctic adventures? Check out our new 2019-20 season! Michelle is a Polar Guide at Quark Expeditions and a safari guide in South Africa. Michelle is passionate about photography, wildlife and the outdoors. In her free time you will find Michelle travelling somewhere remote with her camera in tow.